Nāma Kaumudī’s fundamental definition of the word krishna is, “The supreme spiritual substance.” This harkens to Gopāla-tāpanī Upaniṣad, which explains (in pūrva.1.1) that krish- means “existence.” and –ṇa means “carefree.” The word krishna therefore indicates an entity whose existence is effortless, self-establishing, causeless, without defects, and blissful. That entity is brahman, the supreme spiritual substance — consciousness itself in its pure, original, wholesome form. The word krishna indicates the color black because that color pulls in (krish-) all light (-na). Viṣṇu’s complexion is as black as a tamāla tree. Indeed, the Amara-kośa Sanskrit dictionary states, “Viṣṇu, Krishna, Vaikuṇṭha, and Nārāyaṇa are synonyms.” I will explain why. Viṣṇu literally means “all-pervasive,” denoting the substance which is the essence of everything: consciousness itself. Viṣṇu and krishna are synonyms because they both indicate the effortlessly self-manifest all-pervading substance of reality, consciousness — especially in it’s kinetic, specific fountainhead as a blissful and flawless personality. Vaikuṇṭha literally means “carefree,” again denoting consciousness, and especially the realm of unfettered consciousness and the fountainhead of consciousness. It is therefore synonymous with viṣṇu and krishna. Nārāyaṇa literally means “the reservoir of personhood” and denotes the fountainhead of consciousness. Therefore it is another synonym. Krishna denotes all manifestations of Bhagavān Viṣṇu — the carefree and effortlessly self-manifest personality who is the fountainhead of all-pervasive consciousness. But Nāma Kaumudī finishes its definition by stating that the word krishna specifically refers to someone who was “raised on Yaśodā’s breast.” So, although krishna refers to consciousness itself (brahman) and although it refers to Viṣṇu as the source of all consciousness (paramātmā) and the epitome of all personality (bhagavān), in the ultimate focus this word denotes a very specific form of Bhagavān: the one who is raised by the loving breast-milk of the queen of Vraja, Śrī Yaśodā Devī. Ultimately, the word krishna refers to the famous Gopa of Vṛndāvana whom the Bhāgavata Purāṇa lauds as the fountainhead of all Viṣṇus, who are themselves the fountainheads of all consciousness, which is the very substance of reality itself. The most literal, basic meaning of krish- is simply, “pull.” Earlier I quoted Gopāla-tāpanī Upaniṣad stating that krish- means “existence.” It has this meaning because existence is the tangible coagulation of consciousness, a structure pulled into place by consciousness’ gravity. 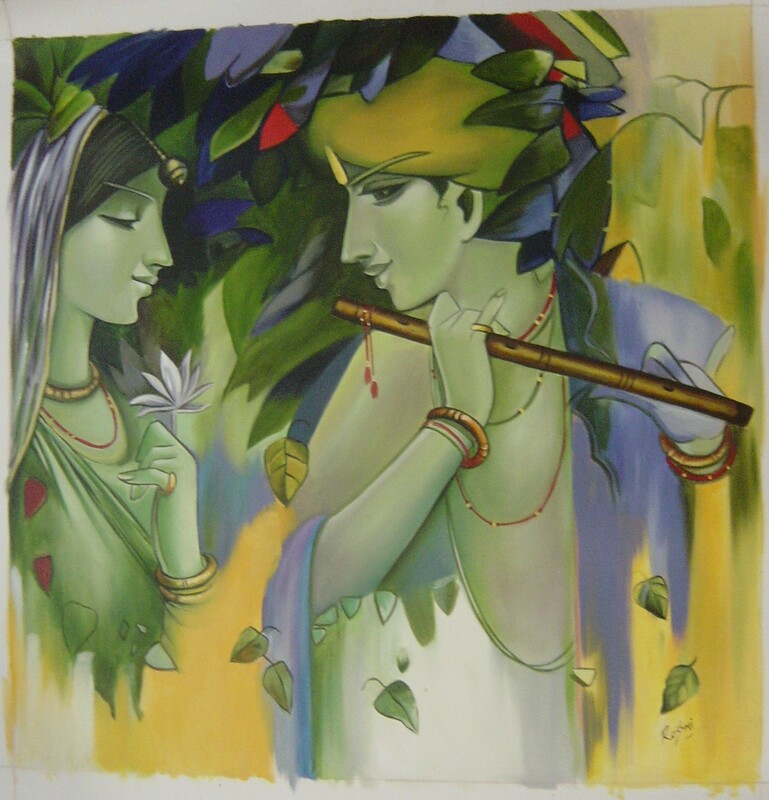 The primary trait of Krishna is that he “pulls,” like a magnet, like gravity. What does he pull? He pulls upon -ṇa. Gopāla-tāpanī Upaniṣad said -ṇa means “carefree.” What is carefree? Pure consciousness. Therefore Monier’s Sanskrit dictionary states that native Sanskrit lexicographers also define -ṇa as knowledge, the power of knowledge, consciousness. Krish-na: he who pulls on consciousness. What does it mean to “pull on consciousness”? It means to attract, fascinate, delight, and enthrall. Krishna emits all consciousness, like a star emitting light, and then, like a black hole, he attracts, fascinates, and enthralls the emitted consciousness – forming a circuit, a loop. Loops amplify. What does Krishna amplify? Carefree existence, bliss – which attains its thickest reality in the form of love, prema. Krishna: the all-attractive amplifier of prema. Interesting. I just looked up Krishna in Sanskrit to english dictionary and it returned some far out results. Here are some that stood out: “evil”, “wicked”, “black spots on the moon” – and a “kind of leech” and “kind of demon or spirit of darkness”? So Krishna is dark like a black hole. Even the light doesn’t escape his attraction. Anything you could call “black” you could also call “Krishna” because Krishna means “black.” Most of the banter and joking Krishna enjoys with the Gopīs headed by Lalitā and Śrī Rādhā utilize this fact. White is often used to symbolize consciousness because it is the brightest color. However “gold” (hiraṇyamaya) or “light” (jyoti) is more often used in Sanskrit literature as a color representing consciousness. QUESTION: How do I understand what an unlimited person is? MY ANSWER: Discuss Bhāgavatam, chant Gāyatrī, and meditate on the Hare Krishna mahāmantra… all under the guidance of a sincere guru, with a humble and open heart with the objective of understanding what an unlimited person is. QUESTION: In what way is someone who was “raised on Yaśodā’s breast” a greater conception than brahman, the supreme spiritual substance — consciousness itself in its pure, original, wholesome form? MY ANSWER: Consciousness is an inherent property of persons. The conception of brahman in absolute isolation is incomplete because in it consciousness is not recognized as the property of any person. Thus in isolated-brahman consciousness is merely latent and potential. The person who has brahman as his property (attribute) is superior to the property itself. That this person was raised on Yaśodā’s breast simply identifies who he is, and hints that he is tender, and exists in the care of feminine beings / śakti. QUESTION: How does one get from an omnipotent, omniscient, omnipresent God to “black as a tamāla tree” and not feel it is a little contrived, poetic and fanciful? QUESTION: I struggle with the idea that the ultimate reality is a blue humanoid with a flute and peacock feather as nice an idea as it to my human mind. If it’s a “nice idea to your human mind” then it shouldn’t be a struggle. You are just casting it in the role of being a quaint, “nice idea” for little minds, and this is why you struggle with it. The origin of reality is all-attractive and all-blissful, because reality exists for the sake of ānanda (joy). Therefore Krishna’s qualities, personality, and pastimes express the deepest philosophical intricicies and secrets. They are not quaint little human anthropomorphisms, as is the poor conclusion of futile minds. QUESTION: I feel I’ve been been indoctrinated into a strictly literal way of thinking about Krishna. MY ANSWER: We should not let ourselves be “indoctrinated” into ANYTHING. We should study Bhāgavatam, Vedānta, Upaniṣadas and the explanations of them with the aim of personal realization.